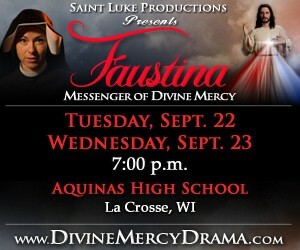 Faustina: Messenger of Divine Mercy, the moving, live production performed by actress Maria Vargo and directed by Leonardo Defilippis of Saint Luke Productions, will be presented at Aquinas High School, Campbell Theater in La Crosse, MN on Tuesday, September 22, and Wednesday, September 23 at 7:00 p.m. The events are sponsored by St. Patrick Parish. Admission is $8.00. For tickets and additional information, email faustinainlacrosse@gmail.com or call the St. Patrick Parish Office at (608) 783-5535.